The modern country started to be formed in 1201 when Bishop Albert Buxthoeven had ordered to establish the city of Riga. Eight years later, the first state called Livonia was formed. Consequently, it caused multiple military conflicts between big neighboring countries. The Russian Empire repeatedly tried to capture the territory of Livonia. The Latvian nation was formed in the 17th century. One of its most difficult historical stages was a turn of the 19th - 20th centuries. It was marked by a series of revolutions and internal political conflicts aimed at achieving the complete independence of the country. Latvia became independent from Soviet Russia in 1918 and from the USSR in 1990. Despite the fact that Latvia has been one of the most popular tourist countries for many years, it has managed to preserve its calm and peaceful atmosphere. Even in the midst of the tourist season, it is possible to enjoy peaceful recreation at large local resorts. Besides rich sightseeing programs, Latvia offers its guests a lot of prospects for organizing their vacation. Jurmala is notable for its enchanting beaches and fascinating parks. There are also magnificent forests near the resort. In Jurmala, a lot of festivals and other holidays involving tourists from different countries are annually celebrated. Liepaja that is very popular with fans of peaceful recreation is not limited only to beaches too. There are popular hiking routes near the resort. When walking, you can see interesting nature attractions. Liepaja is also distinguished by multiple jewelry shops where you can buy exclusive amber items. In Latvia, there are several wellness resorts. The country is notable for its healing springs and lush coniferous forests. Along the Latvian coastline, a lot of balneological centers, health camps and modern spa centers are open for all fans of health recreation. The country is characterized by its mild climate, so travelers visit it almost in any season. In winter, it is very interesting to come here on Christmas Eve. This article about iconic landmarks and sights of Latvia is protected by the copyright law. You can re-use the content, but only under the condition of placement of an active link to www.orangesmile.com. Travelers who plan to visit the Latvian city of Ventspils certainly have to admire the flower clock. The old Latvian town has a good tradition of decorating the streets and parks with incredible compositions of plants. 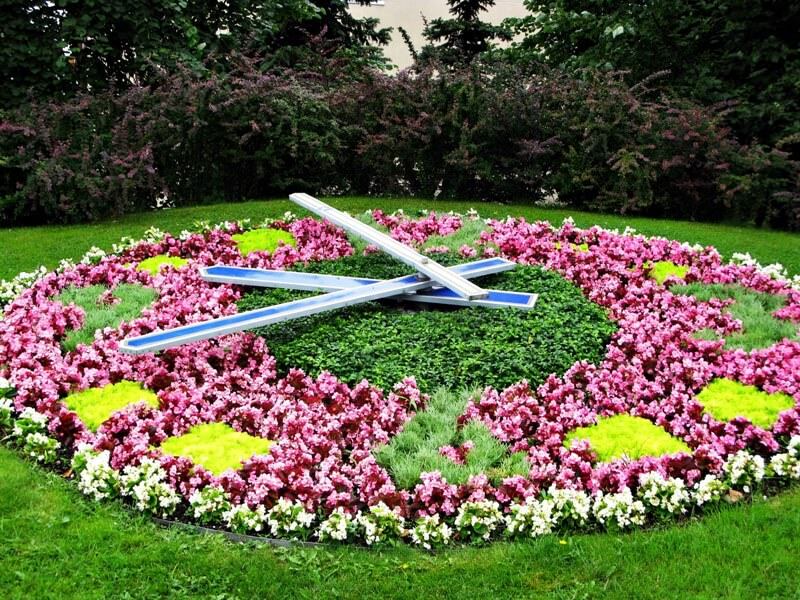 Ventspils can be named the flower capital of Latvia. Not surprisingly, a variety of floral arrangements includes the luxurious flower clock. It’s situated at the intersection of Lielais Street and Kuldigas Street.